Do you remember the 12 Bottle Bar? It started out as a blog, transitioned into a book, and has become a national sensation as it partnered with Crate & Barrel. I’m glad to say I’ve been a fan of Lesley and David from the beginning. Mostly because I really appreciated the core concept. Home bars can definitely get away from you. They can become overwhelming. Especially for the cocktail enthusiast. There are so many base spirits, liqueurs, aperitifs, cordials, vermouths, and so on. But you don’t need all of them. You don’t. Thankfully great bars exist where you can visit and have them make you anything you want. But the home bartender can be very content with a much smaller number of bottles. Especially if you spend some time to thoughtfully consider what you like and what you don’t. The 12 Bottle Bar has a core list of bottles. They count bitters among them. I don’t. I can’t. It’s possible that I may have a bitters problem. But that’s a different post. Today, I wanted to share with you my current set of 12 bottles for two reasons. One, I just picked up something I’m quite excited about. And two, when putting them all together, I realized they reveal something not all that surprising. So what’s new? 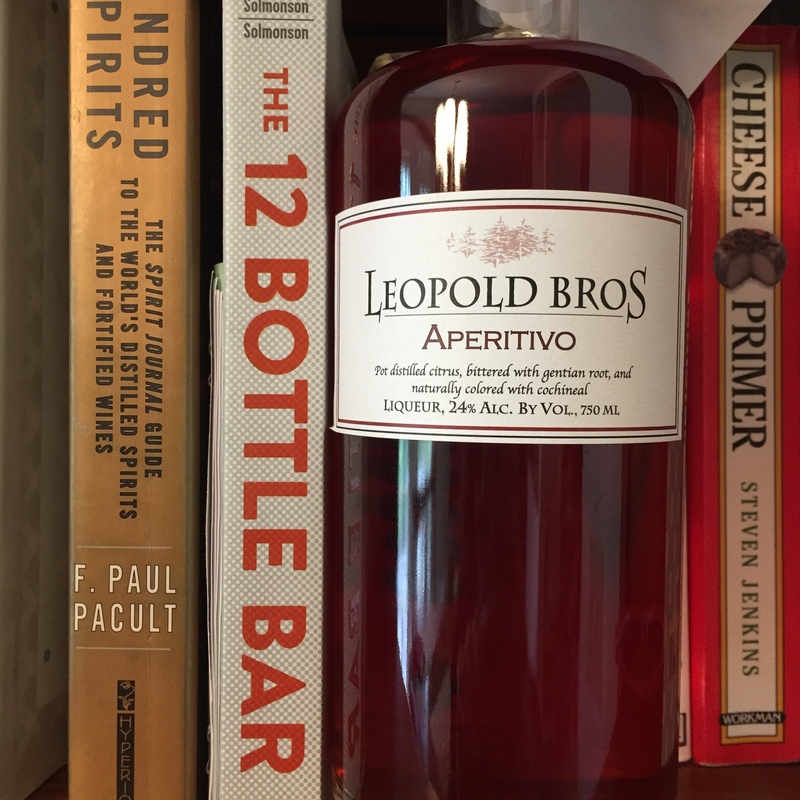 Well, I picked up a bottle of Leopold Bros Aperitivo. It’s a domestic Campari substitute that doesn’t rely on artificial colors to make it a vibrant shade of red. The last thing I want in my cocktails is dreck. That includes high fructose corn syrup and bottled juices. Although, I might consider a few of the cold pressed, high pressure processed juices. But ultimately, that’s more of an academic discussion, since fruit juice doesn’t typically play a role in the drinks I make. That statement may make more sense when you take a peek at the 12 bottles. So let me break down what we’ve got and why. But instead of taking it left to right, I’m going to break the bottles out into categories. Tanqueray gin – It’s a classic. Intensely aromatic. Bold. English. So good. Milagro silver tequila – I buy a bottle every May. Delicate. Floral. Great value. Evan Williams bourbon – Solid. A workhorse. For the price, I haven’t found a better whiskey. Laphroaig Quarter Cask – Smokey. Pour a glass and you’ll swear there’s a fireplace in the room. Dolin dry – I hate this. I used to like it. But it’s too sweet for me. Soon to be replaced. Carpano “Antica Formula” sweet – I love this. It’s expensive, but worth it. Small bottle FTW. Ramazzotti amaro – Italian. Brown. Bitter. Sweet. Aromatic. Citrus. Leopold Bros. Aperitiv0 – Domestic. Red. Bitter. Sweet. Aromatic. Bracing. Green Chartreuse – French. Herbal. Sweet. Herbal. Green. Herbal. So herbal. Did I say herbal? Yellow Chartreuse – French. Herbal. Sweet. Yellow. Peppery. Plays well with whiskey. American Fruit sour cherry cordial – Local. Sweet. Fruity. Cherry. Luxardo Maraschino – Italian. Made from cherries. Tastes more like nuts. Sweet. Aromatic. I’ll be the first to admit that it’s an odd selection of bottles. And I do have to confess, there are a few additional bottles that are on their way out of my own 12 Bottle Bar. And there are a couple which I’m holding on to for my father-in-law who enjoys single malt scotches. But those do not make it in the regular rotation. So, yes. I’m saying that Green Chartreuse is in regular rotation. How? You can’t make a Last Word without it. Plus it’s a critical ingredient in the Laphroaig Project. I even make a modified version of the Alaska Cocktail which puts a tablespoon of Green Chartreuse into two ounces of gin. Most of the time though my cocktail preferences are much more simple. I’ll start with a solid pour of either gin or bourbon, then dress them up with something sweet and aromatic, and finish them off with a few dashes of complementary bitters. So that could be bourbon with a splash of Aperitivo, a dash of Ramazzotti, and a shake of chocolate bitters; or it could be gin, with a bit of dry vermouth, a small spoon of maraschino, and a dash of orange bitters. But as summer rolls around, it’s going to be Rickeys all the time. Gin, bourbon, or tequila. It doesn’t matter. They are all delicious and refreshing in their own way. Not to mention, they are super refreshing, and couldn’t be easier to make. Base spirit. Lime. Seltzer. There’s no mucking around with syrups, no shaking, no measuring. It’s a drink that is perfect in its simplicity. These selections of bottles are perfect for me. I can’t imagine they would be a good fit for most people. But what I endorse if figuring out what drinks you enjoy and building a limited bar around those, knowing that it can change with the seasons. Right now I’m really looking for a way to bring an absinthe into the mix, because that would be a great, refreshing treat for summer too. And again, as an intensely aromatic spirit, it fits well with the overall theme of the bar. A big thanks to All Star Wine & Spirits in Latham for special ordering the Leopold Bros. for me. It’s delicious. The flavors are different than Campari, but I’m thrilled to have the negroni back in my life. Another timely post. I’m been thinking about Negronis and was going shopping for some Campari. Maybe I’ll try the Leopold Bros (assuming All Star ordered a few bottles). I LOVE the Carpano “Antica Formula”; I recently discovered it and have gone through a few bottles already. Makes for a great Manhattan. Maybe I’ll try their own “Negroni Sbagliato” (“mistaken Negroni”) and skip the Campari altogether. Another great vermouth I recently discovered (at Plumb Oyster Bar) is “Del Professore”. I haven’t found it retail yet, maybe I’ll have All Star place an order. As the weather warms I usually shift away from brown-bourboney drinks towards gin – Gibsons or Martinis. If you haven’t yet, I highly recomend Tanquerey TEN. The Stockade Tavern in Kingston introduced me to the Ultima cocktail, which is same recipe as the Last Word, but swaps out gin for mezcal. Good stuff. I’ll give you that Evan Williams is the best bourbon you can find at that price, which is incredibly low. My questions is why would a guy that is clearly focused on the finer details of cocktails settle for “a workhorse” bottle of whiskey mixed in to 11 bottles of much higher quality? One of these things is not like the others. I tend to buy cheaper bottles for some of the cocktails I mix, because sometimes the details of an expensive whiskey can get masked by other ingredients. And it’s fun to find cheaper stuff that works in cocktails, especially when you have to pony up $40 buck a bottle otherwise. I absolutely get what you’re saying and I don’t mean to imply someone should get a bottle of Blanton’s to make a cocktail. A 1.75 liter bottle of Evan Williams is about $25. For $50, you can get two .75L bottles of Evan Williams single barrel or 1.75L or Maker’s Mark. I think either of those would make a significantly better cocktail. There’s more bourbon in that price range too. For a carefully selected 12 bottle bar, I’d argue the bourbon should be better than a handle of Evan Williams. Not top shelf, but still better. I’ve got two answers for you. First and foremost, the bottle of Evan Williams isn’t technically my choice. Let’s just say that someone in this house enjoys her occasional Evan Williams and Martini & Rossi “Manhattan” so those two bottles will remain a fixture in our liquor cabinet. Given that fact, the second reason comes from Gary “Gaz” Regan. He’s a giant in the cocktail world. I can’t find the quotation on the internet, but he gets to drink all kinds of marvelous whiskey as part of his job. But a few years back, he proclaimed his affection for Evan Williams when drinking at home on his own dime. So if it’s in the house anyway, and it’s good enough for Gaz, it’s good enough for me. But really, I prefer rye, and around the fall, I suspect a nice bottle of rye will make it back into the 12BB rotation. It just seemed out of place in such a carefully curated collection. Curious to see which Rye gets the call to the show. I really enjoy the stuff from Willett. But we’ll cross that bridge when we get there. I mail order half bottles and make sure to drink lots of Negronis to use it up before it spoils. I am fascinated by your selection and would love to try all of your “stickies”. BTW, Empire now has Cocchi sweet vermouth 375 and 750ml. (you want the 375 unless you are a bar). And curses to you Daniel, I have bought my second bottle of Chartreuse since reading this.